What is an Enterprise Architecture? In this modern world there is lots of confusion about enterprise architecture, in that sense I would write a short scribble about enterprise architecture or called as EA in short. Enterprise architecture (EA) is “a well-defined practice for conducting enterprise analysis, design, planning, and implementation, using a comprehensive approach at all times, for the successful development and execution of strategy. Enterprise architecture applies architecture principles and practices to guide organizations through the business, information, process, and technology changes necessary to execute their strategies. Now that sums up as EA is putting together a practice for translating business goals and strategy into practical enterprise to Business Process + Information Systems (Data and Applications) and Technologies within an “Enterprise”. This also conclude a desired state of the enterprise and facilitate towards its change. How do you achieve that? Answer is short, through Architecture Governance through a selection of desired Architecture Framework. That makes EA an essential practice that at any organizational level to have all the systems functioning as desired. What is an Enterprise Architecture Framework? An enterprise architecture framework (EA framework) defines how to create and use an enterprise architecture. ARCON – A Reference Architecture for Collaborative Networks – not focused on a single enterprise but rather on networks of enterprises. RM-ODP – the Reference Model of Open Distributed Processing (ITU-T Rec. X.901-X.904 | ISO/IEC 10746) defines an enterprise architecture framework for structuring the specifications of open distributed systems. TOGAF – The Open Group Architecture Framework – a widely used framework including an architectural Development Method and standards for describing various types of architecture. Treasury Enterprise Architecture Framework (TEAF) – a framework for treasury, published by the US Department of the Treasury in July 2000. MEGAF is an infrastructure for realizing architecture frameworks that conform to the definition of architecture framework provided in ISO/IEC/IEEE 42010. TRAK – a general systems-oriented framework based on MODAF 1.2 and released under GPL/GFDL. SABSA is an open framework and methodology for Enterprise Security Architecture and Service Management, that is risk based and focuses on integrating security into business and IT management. Avancier Methods (AM) Processes and documentation advice for enterprise and solution architects, supported by training and certification. BRM (Build-Run-Manage) Framework – an architecture framework created by Sanjeev “Sunny” Mishra during his early days at IBM in 2000. DYA framework developed by Sogeti since 2004. Purdue Enterprise Reference Architecture developed by Theodore J. Williams at the Purdue University early 1990s. Solution Architecting Mechanism (SAM) – A coherent architecture framework consisting of a set of integral modules. Hope that covers the initial concepts of Enterprise Architecture. Later sessions I would write more on an interesting and widely used Enterprise Architecture framework called TOGAF – The Open Group Architecture Framework. My passion is technology and living with it, and my ultimate goal is to become an Enterprise Architect, as a major step to continue with the path I should be following, I am TOGAF 9.2 certified as on today. It was a long due one, finally I am able to accomplish it. Great experience preparing for this certification examination. The Open Group Architecture Framework (TOGAF) is a framework for enterprise architecture which provides an approach for designing, planning, implementing, and governing an enterprise information technology architecture. To make it simple: The Open Group Architecture Framework (TOGAF) is a framework – a detailed method and a set of supporting tools – for developing an enterprise architecture. TOGAF® is the de facto global standard for Enterprise Architecture. The Open Group Architecture Forum, comprised of more than 200 enterprises, develops and maintains the TOGAF standard and publishes successive versions at regular intervals. TOGAF is a high level approach to design. 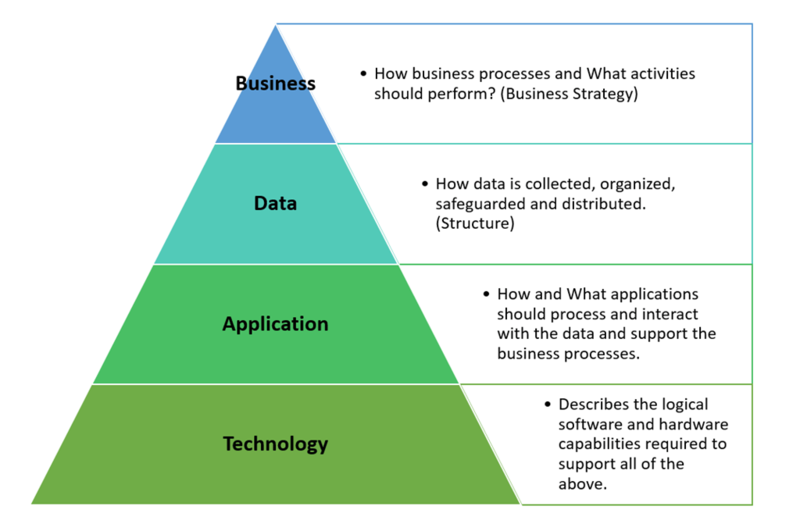 It is typically modeled at four levels: Business, Application, Data, and Technology. It relies heavily on modularization, standardization, and already existing, proven technologies and products. Ensuring that everyone speaks the same language. Avoiding lock-in to proprietary solutions by standardizing on open methods for Enterprise Architecture. Saving time and money, and utilize resources more effectively.